I have done very little crafting since my mother came out of hospital, as she has been taking up a lot of my time and energy, though I did make a few books which I will post about soon. I still haven’t finished the second sock using the hand-dyed yarn which I posted about in May, but she is back in hospital again, so I expect my sock knitting to speed up again as I’ll be knitting while travelling and sitting with her. I already have my next pair planned, in a subtle (cough) sunshine yellow/orange space-dyed yarn. They are for my DH and it was his choice of yarn and colour. I’m not too happy about it, as 100% merino is not my first choice for socks, particularly for someone who is tough on socks. I’ve been knitting socks while visiting my mother in hospital, and I continued while sitting with her after she went home, as I couldn’t do anything complicated. 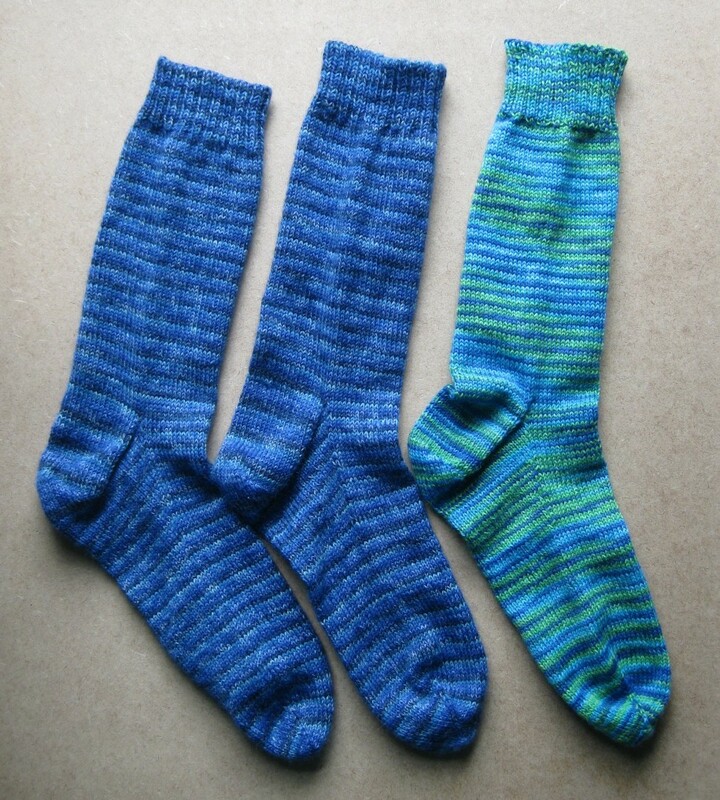 I did the second sock of the blue pair (Opal yarn), and then I couldn’t resist starting on the yarn which I dyed at the workshop in February. 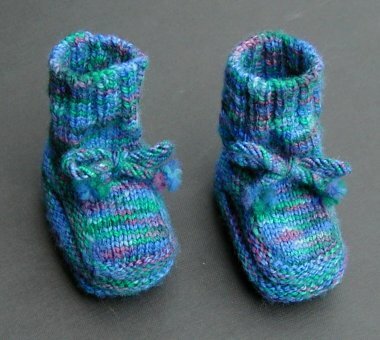 Both were knitted on 2.25mm Brittany dpns. Here is a detail – click on the image to see the whole photo. My own knitting has been going well, though slowly. I have almost finished a pair of Regia socks, as they have been my mindless knitting while visiting my mother in hospital (mainly on the journeys to and fro). As she isn’t likely to go home for a while yet, I needed to set up my next ‘car knitting’ project, so I’ve started on the yarn from the dyed sock blank. 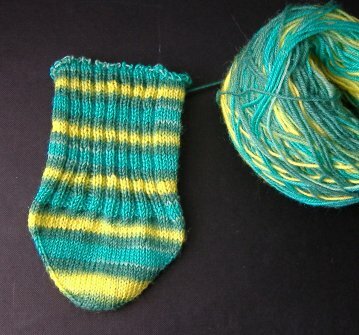 I have finished one toe, but as I’ve not used this yarn before and I didn’t swatch (bad Jenny! ), I may have to do a bit of ripping after a couple more inches to adjust the number of stitches. At least I’ll have something to keep my fingers busy, so I won’t mind too much if that happens. Between still not feeling well myself and having to deal with the situation with my mother, I haven’t got much done over the past few weeks, but I have finally got around to unravelling the sock blank I dyed back in February at the Procion MX workshop. It had been knitted with 2 strands of yarn held together (one for each sock) so as I unravelled it, I made it into 2 loose piles. 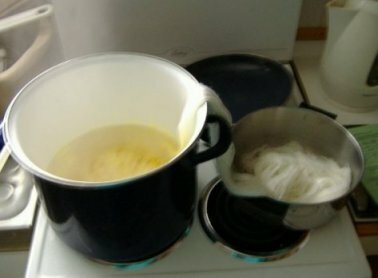 The yarn was very curly after being dyed and washed as knitted fabric, so I had to wind it into skeins and steam them before I could wind them into balls. 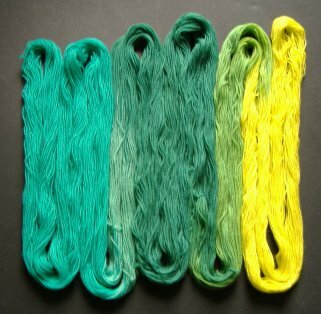 On the left is a hank of dip-dyed superwash merino/nylon sock yarn. It was just an afterthought when I found I had a little time left at the end of the afternoon. It didn’t work out quite as planned, as the pink was stronger than I had intended and the yarn ‘grabbed’ the dye very quickly so there wasn’t enough left to give the gentle transition between the colours. I might overdye the almost-white sections with more pink but I’ll probably just leave them as they are. The two pieces of printed cotton were just an experiment to see how the colours worked over existing patterning. 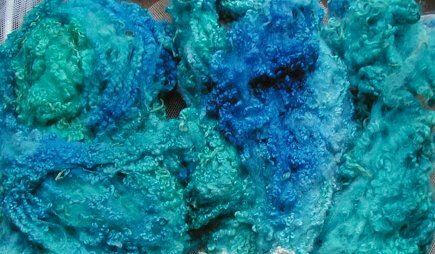 The standard 1% dye solution was not strong enough so I had use too much. It still didn’t give the depth of colour I wanted and the colours on the larger piece merged together too much. I need some more experimentation with that. I have been distracted this week, but I do have another project started. I probably will not have a picture of that until at least Sunday, even though it is only a small project. … and still making stuff – sometimes more successfully than others.Â The silk scarf I was working on for the competition and exhibition didn’t work out, but I’m hoping to salvage it in some way.Â I hope to have pics of it on the loom in a day or two.Â I’m still working on tablet-woven bookmarks for the exhibitionÂ too. and I am working on 2 more snakes. 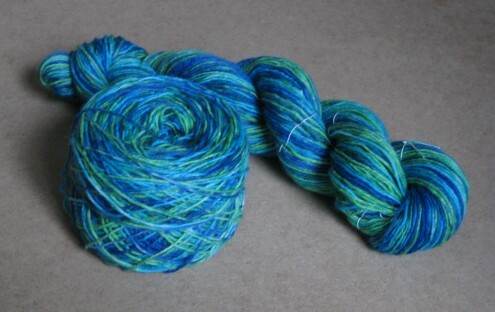 I decided to try some long-repeat dyeing for socks for a friend, and here it isÂ …. Bright, isn’t it?Â Â Not my colours but I hope she will like it. I did a lot of swatching for this KAL, including Zephyr, but I decided in the end that I don’t want a stole, so I’m going to knit it as a scarf. 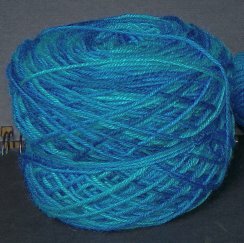 I was given some Skacel Merino Lace by an online friend and hadn’t found the right project for it. It is nearer cobweb than laceweight, so I swatched with 2.50 mm and 2.75 mm needles (US #1.5 and #2). I’m going to go with the 2.75 mm, which will give a scarf about 12.4″ by 58″. That seems a good size for a cobweb scarf to me. So here are the swatches. They are lacier in real life than they look here. No pictures today, but I might get some taken over the weekend as I have a lot of things that need to be photographed. However, we have to go new-to-us car hunting urgently this weekend as our current one died this week. My most urgent current project, other than the car, is to get at least two more pairs of slippers knitted for my mother by her birthday (less than 4 weeks). The old ones wore out too quickly, so I am going to use the same yarn I used for her socks, as that seems to be lasting better. It’s Paton’s Diploma Gold DK, and I picked up 4 balls each of navy and denim so I can make at least 3 pairs of slippers and one more pair of socks, maybe a second pair of socks too. That’s how many she requested for her birthday, but she doesn’t expect me to get them all done in time. 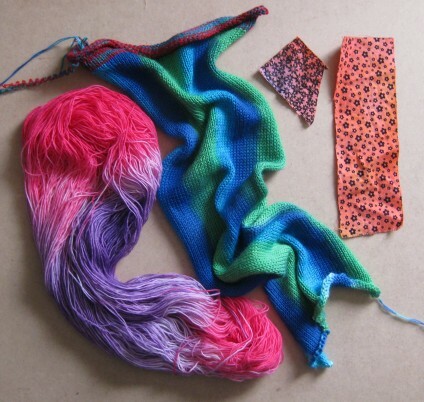 I’ve been swatching for other projects – the Mystery Stole 2 KAL and the Icarus shawl from the latest Interweave Knits. I haven’t joined the Icarus KAL yet but I might. The Icarus is for me, and I have a cone of 2/16 cashmere from ColourMart UK. I can’t stop fondling the swatches as they feel so wonderful. I’m doing the Mystery Stole in Skacel Merino Lace, which is almost cobweb weight, so it will actually be a scarf. I’ll probably end up giving that one away, unless I totally fall in love with the pattern when I finally see it complete. Before I start either of those, I’m trying to finish the edging on the fan stitch half circle shawl from Waterman’s shawl book. Well, that’s all the fibre news from Chez Jenny for today. I hope I’ll manage to do the next update a bit more promptly than this one. After many tries, we still haven’t managed to get the colours to show correctly. 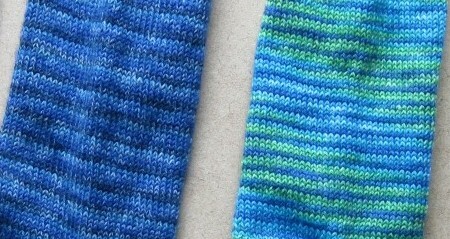 The actual sockies are darker, more saturated colours, but this picture does give some idea of the effect. I wanted the ‘dashes’ of each colour, just 4 or 5 stitches, and no pooling and that is what I got. These sockies are fun to knit. I have a lot of the yarn left over, but not quite enough for another pair. 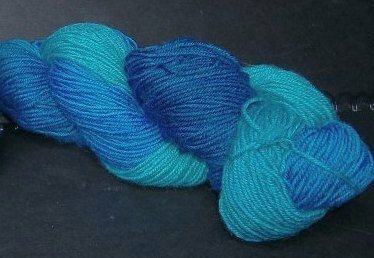 I’m going to spin and dye a bit more yarn, maybe solid dye it in a colour from the yarn, then use it to knit parts of the sock – maybe just for the soles and cuffs and to make the cord. One of my guilds, Kennet Valley, has been meeting in a church hall for many years. 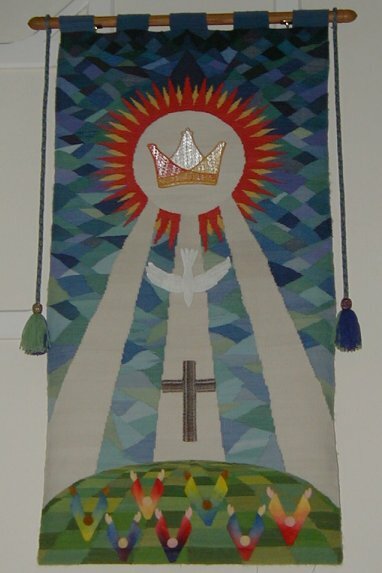 As a gesture of thanks, it was decided to make a tapestry for the church using as many of our crafts as possible. It took us a few years, but it was finally hung in the church last month. The main part of the tapestry is woven from Cotswold and other long wools spun by guild members (including me *grin*). The cross was inkle woven, the dove and the crown are bobbin lace (I’m not sure whether they were made with handspun thread) and so on.